Respect and help maintain a quiet zendo atmosphere; be aware of your movements and the sounds you make. There should be no conversation in the zendo, except as necessary until the final 3 bells and bow is completed. Please make sure to turn off your cellphone or leave it in your car. 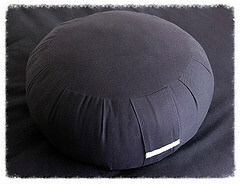 After selecting and placing the appropriate zafu (small round or square cushion) on the zabuton (large cushioned mat). 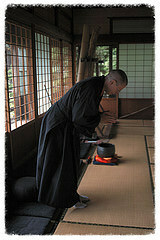 One bows again in gassho to the cushion, turns and bows to the sangha,(community) and is seated. It is desirable to sit in this manner if at all possible, although chairs are available if necessary. 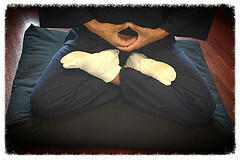 Hands are then placed on the lap forming a mudra (left hand on top of the right and thumbs gently touching, forming an oval). Eyes are generally half closed with the focus being on the floor a few feet away. The back is kept straight. Then comes the simple, and frequently the most difficult part of zazen: quieting the mind so as not to have “monkey mind” (mind always shifting away to thoughts, worries, dreams, plans, and even sleep!) Instead one focuses on the present moment and what is being experienced. 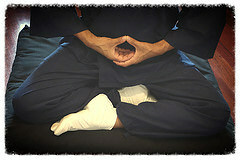 There are many techniques to assist the student, with the most common one being to “follow the breath”. Counting “one” on the inhalation, and “two” on the exhalation up to “ten” is one suggested method. It is surprising how very infrequently one gets to ten without the mind wandering off on its own thoughts. When that is observed, it is important to gently, and without judgment, bring the breath back to “one” and begin again. 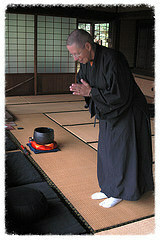 The zazen period begins with a short series of rituals including a chant. 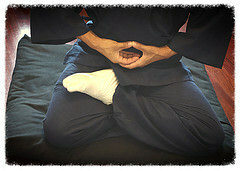 We sit for 55 minutes, followed by a short teisho (teaching). Toward the mid-point of the sitting, students are given a welcoming of heart to heart with the gentle use of the keisaku (a board used to lightly tap the student’s shoulders). This also communicates the message to “Wake up to this moment”. 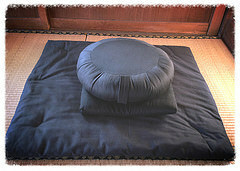 Zazen is easy, hard, and natural and sounds more complicated than it really is. We are each always learning and practicing. In the words of one Zen phrase, “We are always beginning again”. Our zazenkai is supported by donations from our students. We thank for your support.